A re-visit to Oz-The Wizard of Oz by Baum – Joyce's mystery and fiction book reviews with some non-fiction too! So, my children’s lit class has moved on from Little Women to another resourceful girl, Dorothy. I had read this book as a child, have seen the movie many times and was looking forward to going back to the book again. In class a far more political view was discussed. There was a high school English teacher named Littlefield who saw this book as reflecting the Populist (a political party) sentiments of the time. At the time, farmers wanted silver to be added to gold money so that more could be issued. 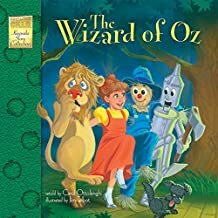 This is seen in the book when Dorothy wears her Silver, not red, slippers on the Yellow (gold) Brick Road. In the novel, the farmers on the prairies are suffering as was true after the Civil War. Dorothy’s life is literally turned upside down as was true for those who struggled. In this understanding of the novel, the Scarecrow is a stand in for the farmer, the Tinman represents factory workers and the Lion stood for William Jennings Bryant. Others viewed the novel as related to the Gilded Age. Capitalism put a (false) sheen on everything and Oz is seen to shine in that way. The novel can also be looked at as Dorothy’s coming of age story; in this view it is the story of an orphan’s self-discovery. How do you view The Wizard of Oz? I would love to hear your thoughts. Have you thought about re-reading this very American, childhood classic? Jeez, I never thought of The Wizard of Oz as being political. Though, I suppose the best books have deeper themes that you can only truly understand as an adult.